Former drag racer John Anderson started his oval track career in 1965 after visiting Flat Rock Speedway in Michigan one night after the drags were rained out. Just two years later he won the Michigan State Figure 8 championship. In 1968 he began driving late models, becoming the ARCA and MARC Times "Rookie of the Year". By 1972 he had won 34 features at tracks throughout Michigan, Ohio, and Indiana. He also won his first track championship in 1969 at Baer Field in Ft. Wayne, Indiana. 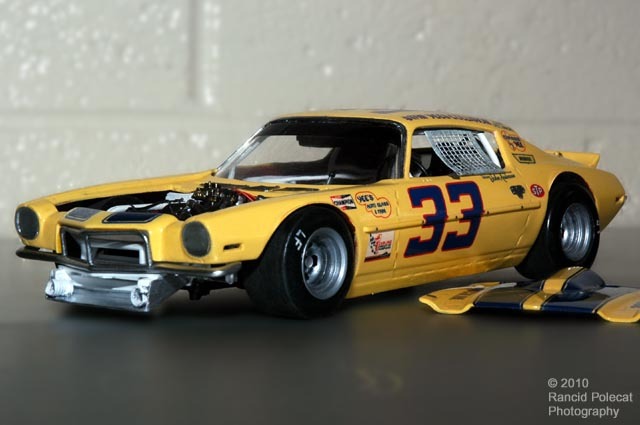 In 1973 Anderson and car owner Stan Yee teamed up to dominate the local ARCA shorts tracks with the Yee-built Camaro replicated here by Tom Faletti. They remained a winning combination throughout the 1975 season after which Anderson and Yee parted ways.